Mastering the line drawing skill will give you great confidence in your drawing ability because doing a line drawing requires you to look more closely and accurately than any other skill you have practiced before. The entire form must be expressed by your line, so you will have to think carefully about the way you put it down. In practicing line drawing skills, students have commented that, after a time, when they are drawing this way,it feels like they are carving into the white paper with their pencil. I call this the "soft paper phenomenon" and it happens because as the students becomes more and more aware of using an expressive line, pressing and releasing which changes the strength of the line begins to feel as if the paper were almost like clay that they were carving into. Here is a video I created that will help you develop your line drawing skills. Arrange heavy fabric (canvas or a towel) on a table. Make folds but keep the arrangement simple. Use a pencil to lightly draw the drapery. Erase and correct as you go until you think you have drawn the drapery fairly accurately. Don't spend more that 20 minutes. Now, make some of the lines dark and some lighter. Think of dark lines as expressing shadows and lighter lines as expressing light. Think--how can a black line really express this shape? How can I make it simple yet powerful? When you think the drawing is done, step back and look carefully at it. What could you do to make it more precise, simpler, more powerful? 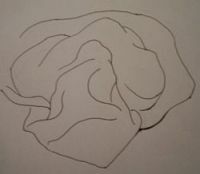 Go to my Basic Drawing Lesson Five. Hi Lois, thought I would send you a quick note to tell you how much I appreciate your YouTube videos. I found you last December when I purchased a Breville smart oven. I'd never really used a toaster oven for anything other than toast and since finding you I've been cooking like crazy! My husband thinks that's wonderful. Hey lois I am a emerging artist here in sc I haven't had the opportunity to go to formal art schools I have been drawing all my life as far back as I can remember. I saw your free art classes online and book marked them and when I have more supplies am going back. I want to be taken seriously, I have started getting my art out there, and have started just recently showing, my art, and sold a total of three works for aprox300.00 a piece I still don't feel like I am a good enough artists and I desire to learn always learning I am sending some samples of a small amount of sketches drawings, and paintings I would love to get feed back from someone in the artworld I have been mistreated by some artist that wouldn't even look at my art when they found out I had not took art classes.......I've always wanted to just havent had the opportunitys . thank you so much. Hello Lois. Thanks for giving me the opportunity to learn hoy to draw and paint in diferentes styles and techniques. I just started and I've never had taken any classes til now with your tutorial. I really worldwide appreciate your comments about my still life exercise. I specially have problems with shading the table and painting the wood graining (as you can se in the picture) and also the table cloth. The melon sas difficult too, I feel something is missing there too . (Some things in the picture I didn't want them to apear in my painting) I'm starting to work with the landscape. As son as I have ir done I'll send you the picture. Best regards and thank you again. I discovered your website today and I am so impressed by the content. Not only it is free but is far superior to other websites. My name is Dena and I'm from Queensland in Australia. Just recently (few weeks ago I picked up a paint brush and love it!!! I'm a Mother of 4 and 46 this year, work full time real estate sales. I've never had an art lesson and was surfing the Internet for free tutorage on acrylics. That's how I discovered your incredibly helpful site. You are the one that should be charging not the majority of other ones I have found. My question to you is below is a painting that I'm trying to copy, however the running bits of paint at top I'm not sure how to get that effect. I have had the immense pleasure of discovering your web site and found your online studies. I am a retired person and one of my goals now is to learn drawing and eventually, painting, at which time I'll need formal tutoring or teaching. I made the list of materials to start drawing and am now going out to buy them, then I'll start the six lessons you suggest. I am so excited that I wanted to thank you for being so generous to the rest of us by teaching freely on line. Happy New Year! Work for line expression in your pen and ink drawing. By just pressing down, you can make your line slightly thicker to indicate shadows. By drawing the line lightly, the form that you delineate will look illuminated. The type of pen you are using will determine the degree of expression of your line. Roller ball, Rapidographs and Pilot pens mainly create a fine, unvarying line. Felt tips, chisel points and split tip pens give more variation of line. If you can, purchase several types of pens and experiment with the lines you can make in the pen and ink exercises. 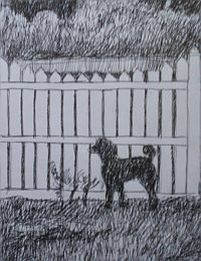 Now that you have practiced with single lines, try the crosshatching technique you learned in using your pencil and see what happens in pen and ink! Work for rich tonalities ranging from very dark areas, to very light areas.